French Kiss Cafe, 517 Dempster St. The new cafe is slated to open on Saturday. A new French cafe will open to the public on Saturday, after the Dempster Street property switched ownership from an Argentine dessert shop, said Stepan Badasyan, owner of the new cafe. French Kiss Cafe, located at 517 Dempster St., will take the place of FRÍO Gelato, which moved two doors down to the corner of Dempster Street and Chicago Avenue. The new cafe will serve pastries, sandwiches and salads in addition to cafe-style refreshments, Badasyan said. Badasyan’s wife Naira will be the primary chef preparing the cafe’s food, he said. Opening the cafe is his wife’s “dream come true,” Badasyan said. The new cafe combines Armenian and French cuisine, reflecting his wife’s familial influences growing up, Badasyan said. He added that she graduated from an Armenian culinary school, but she learned how to make “all the French food” from her mother, who was born in France. Badasyan said he is excited to open this “first location,” with hopes of turning the cafe into a franchise spreading throughout Chicago and its suburbs. The Skokie resident said he plans to start at Dempster Street, “work it for a month or so” and then open up another location. Adding French Kiss Cafe to Evanston’s community highlights how the city “revolves around independent businesses,” said Paul Zalmezak, Evanston’s economic development manager. He said this cafe’s “passion” for delivering a specific style of French food helps set them apart. FRÍO Gelato, the business previously occupying the space, was closed from Nov. 30 to Jan. 19 as it transitioned to a location two doors down, said owner Karla Tennies Koziura. The gelato shop has had a location in Evanston since 2014, she said. 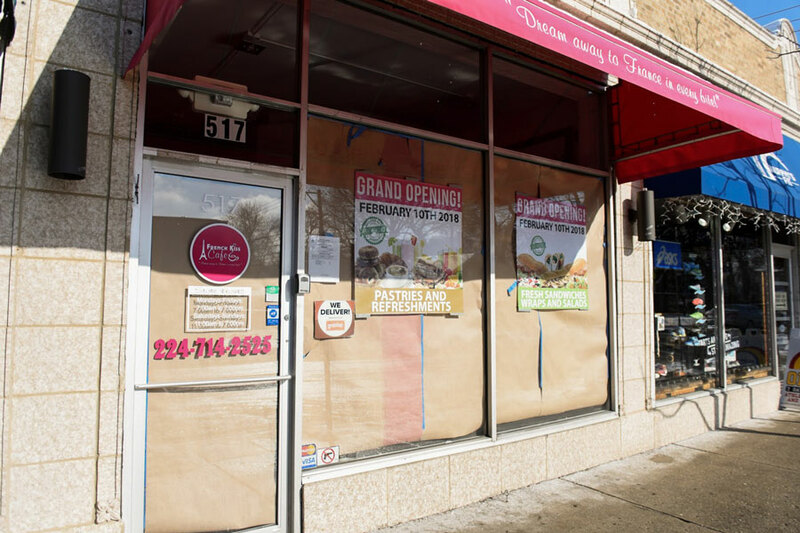 Koziura said she always wanted FRÍO Gelato to open on the corner — and wanted to purchase that property before purchasing the Dempster Street location — because of the space’s history of being a frozen dessert corner. “The location is a little bit nostalgic of, ‘This is where I would go when I was growing up when I wanted to get frozen desserts,’” she said. Since moving to Evanston in 1997, Koziura said the city has become like home to her. Evanston welcomes the “unique small business person” she has established herself as, she said. Living in the city her business serves has strengthened Koziura’s ties to the community, a factor directly tied to her shop’s success, she said. But primarily, success correlates with moving the store’s location, she said.